Did Someone Say Montepulciano? | Sprezzatura, Y'all! Saturday we had lunch in Montepulciano with our friend Francesco and his family. Francesco is an Egyptologist and met our daughter-in-law (another Egyptologist) at a conference several years ago. Somehow we became involved and have stayed in touch with him over the years. He’s stayed with us in Atlanta and we’ve taken him to all the hot spots, like Fat Matt’s. People who stay with us experience the best there is. Anyway, he became a convert to southern BBQ and he taught us how to make limoncello. A fair trade, I must say. We had a leisurely morning – Steve getting his obligatory pastry from the bakery in town, reading the news of the day (which we could probably do without, given that it’s all depressing), and having our morning walk. This morning it was gorgeous – a little breezy, but bright and sunny. The perfect day for a walk out in the country. Anghiari is a town of about 5,000 and the centro (the city center) is really small. If you walk out of town in any direction, you’re pretty much in the country. One of our favorite walks is toward the Rognosi nature preserve. From the main piazza you walk up the hill to the top of town and three minutes later you are in the country. Beautiful, gorgeous, life affirming country. Clean air, great views, and pristine forests. This is what I love about this place. It’s a city with great restaurants and events but it’s so very close to the countryside. It’s the best of both worlds to me. For someone who grew up in rural Georgia, having a cultured town so close to farmland is incomprehensible. You’re either in the sticks or in the city. Not here. You can really have one toe in the country and one in the city. I love it. After our walk, we headed to Montepulciano. This is one of the great wine regions of Italy. The famed Vino Nobile di Montepulciano is one of the best wines in Italy. 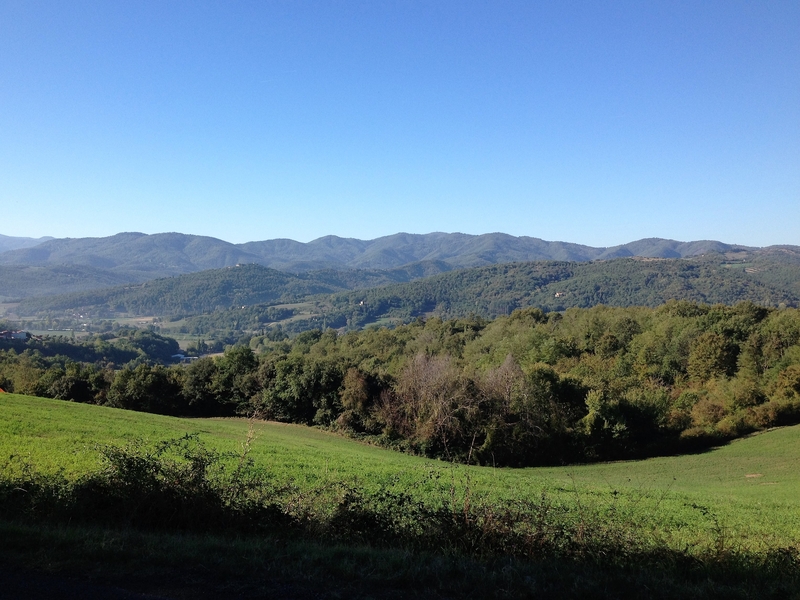 Francesco lives about 5 minutes out of Montepulciano and the view from his house is incredible. He lives there with his wife Olivia and their children Maria and Leonardo. Olivia has leukemia and has been in remission for several years. Then it recently made an unwelcome appearance again. She has had many treatments and is doing OK. She looked good and seemed very energetic. Maria is 18 and leaves for college in Rome on Sunday and Leonardo is 8 and will miss his big sister in a big way. 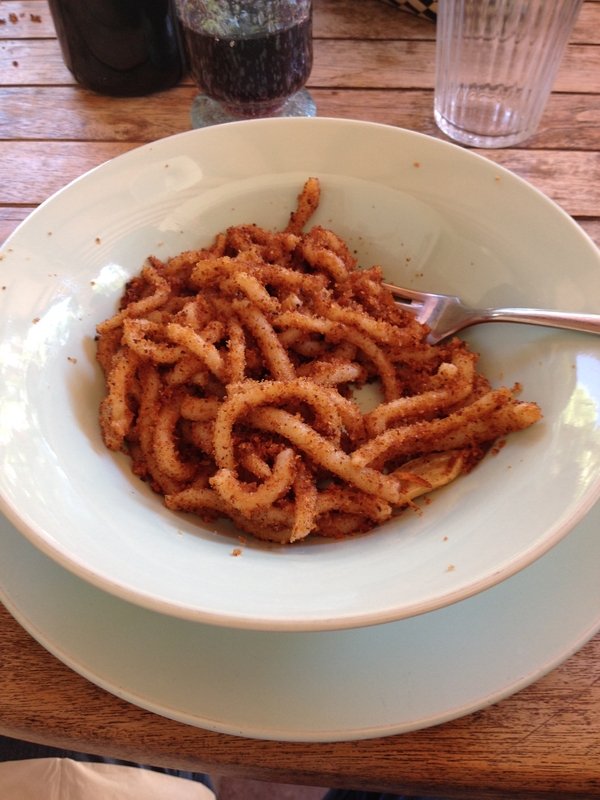 For lunch they made pici pasta with breadcrumbs and with ragu. According to them, these are the only two ways to have pici pasta. No other sauce will do. Anything else it to be frowned upon. We certainly didn’t frown upon either of these sauces. A crispy, garlicy, oily breadcrumb topping and a tomatoey, meaty sauce. We had to have helpings of each. They had eggplant prepared in the way that our dear Italian friend Ludo taught us to make it – simply cut into thin strips, put into a hot skillet with no oil and browned on each side, then the oil is poured on after it’s taken off the heat and it’s topped with some chopped mint. Wonderful. Along with that were grilled peppers. Then after all that were sausages and ribs. They told us they were serving us the traditional Tuscan ribs, not the ribs they prefer, which are slathered in Fat Matt’s BBQ sauce! They thought we would not think that was special so they prepared them in the usual way. Ribs – an international food with local embellishments. We had a great afternoon talking about the similarities between Trump and Berlusconi, going to college, and following your passion. I have great pictures of our outdoor feast overlooking the countryside, but for some unknown and very frustrating reason I can’t upload them here. Use your imagination. 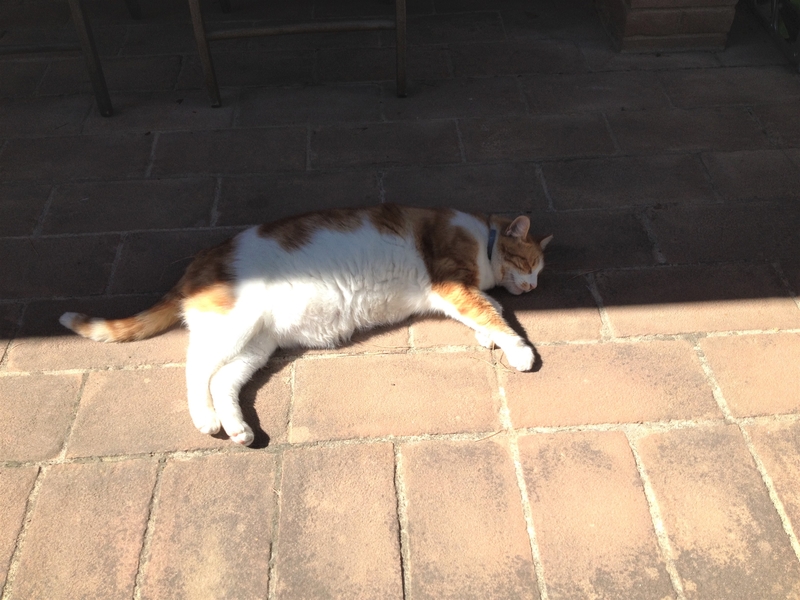 Although I do have a picture of Percy the cat taking a sunbath. 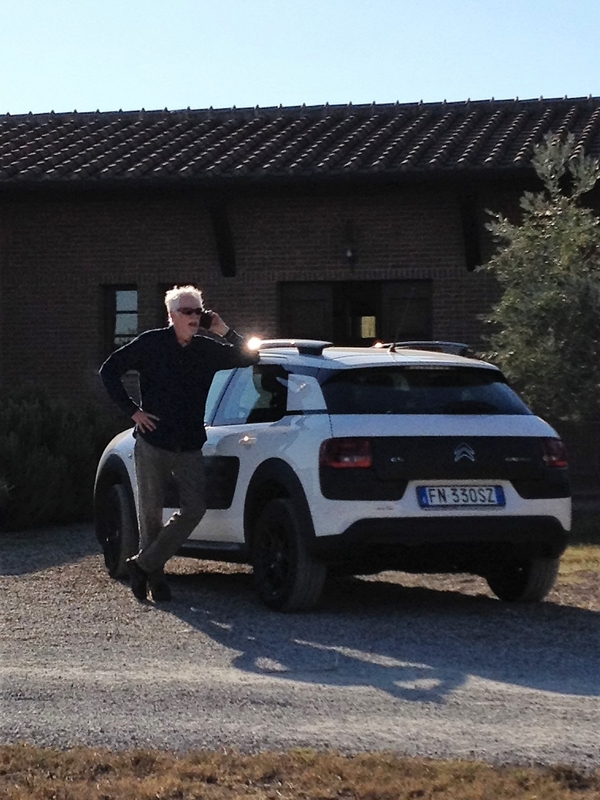 After we said our goodbyes and our good lucks we drove back to Anghiari through the rich vineyards of Montepulicano. We stopped at two wineries for tastings and had such a wonderful experience at the second one that we declared the whole day perfect. It was Nottola – a wine that we’ve had many times and have always enjoyed. We pulled in and the place looked deserted. I wandered into the reception area for the inn that they run and the very effusive gentleman at the desk said he would be happy to give us a tasting. Here’s something I don’t understand. When I walked into the door, he said “Buona sera” and I said “Buona sera” back to him. Then he immediately said, “yes, ma’am, what can I do for you?” How did he know I was English speaking? I could have been Dutch, German, South American, French, Spanish, anything. What is it about me that screams “I AM AMERICAN”? Maybe I don’t want to know the answer to that question. Regardless, it’s a little deflating when the assumption is that I speak English and only English. It’s true that I speak English and only English, but I have intentions to speak other languages and shouldn’t be defined by my current linguistic abilities. Steve and our ugly car! Anyway, he was delightful and extremely informative about the Vino Nobile wine and its cousins. So informative we bought seven bottles. Well, we’re here for another nine days, so we’ll drink some and bring some back to Atlanta. And we’ll give some to our friends here. So that’s not so bad, is it? Then back to Anghiari to take in the early evening sky from our balcony. We were full from our feast at lunch, so we went without dinner – just a snack. It’s cool here at night. You need a little jacket or wrap when you’re outside at night. It’s perfect for us. Warm, not hot, during the day and cool in the evening. And being out on the balcony is heavenly for us. The view is tremendous and the chill in the air is just perfect. These are the kind of days that I live for. Perfect weather, visits with compatible people, unexpected excursions to wonderful places and ending it all in a 16th century palazzo with a view over the ancient city. I feel very much like a princess. Or a queen. Or some other type of nobility. 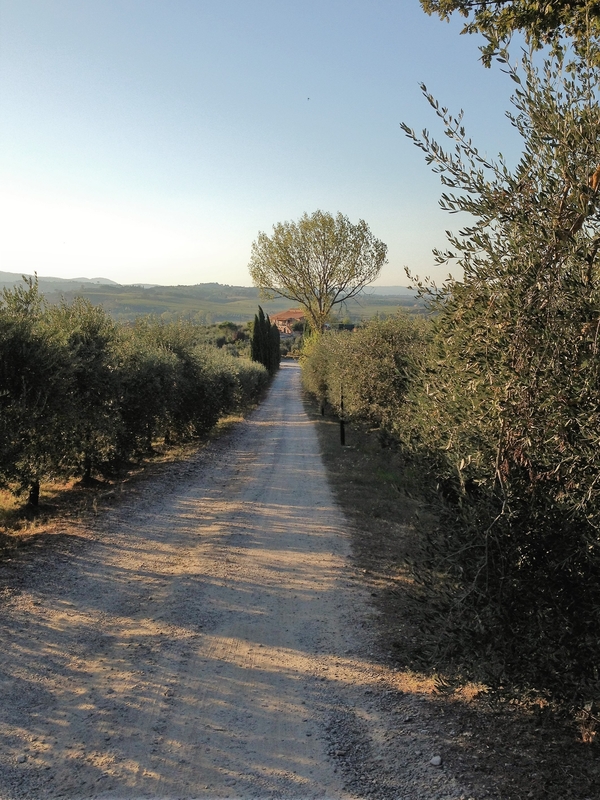 After all, we tasted the Vino Nobile – the wine of the nobles. Doesn’t that make us royalty? In my book, it does.